The world and many of the characters we encounter in The Favourite are based on fact. Queen Anne (portrayed here by Olivia Colman) is described as one of history’s most ignored monarchs. She was introverted and suffered extensively from gout and other ailments. However, she reigned at a time when, with the unification of England and Scotland, Great Britain was born, and was on the verge of becoming a global power. The film imagines what went on behind closed doors as two of Anne’s closest confidantes clash for the title of Her Majesty’s favourite. These are Lady Sarah Churchill (Rachel Weisz), Anne’s friend since childhood who became the Queen’s go-to political adviser; and Sarah’s penniless cousin Abigail Hill (Emma Stone), who arrives at the palace to take a job as a chambermaid, only to rise within Palace ranks to befriend the Queen. Despite its royal credentials, The Favourite is as far removed from a typical stuffy costume drama as you can imagine. It is a tale told with lashings of drama, debauchery, droll humour and despair, as the ailing Queen deals publicly with squabbling politicians while England wages war with the French; and privately with her own demons as the two women closest to her wage war on one another. My only previous encounter with Greek director Yorgos Lanthimos’ work was his acclaimed 2016 The Lobster, which I confess I personally disliked. I found it weird, but never wonderful; totally barmy and wholly nonsensical; over the top and overdone. And, despite its originality it left me totally cold, as I simply could not engage with any of the characters. The admittedly colourful director’s trademark ambitious and epic flights of fancy are totally present and correct here. But, in creating a trio of hot-blooded, three-dimensional, complex characters in this lusty love triangle (yes, it does get steamy and Sapphic at points) and political power struggle, Lanthimos had me hooked, abetted in no small way by the immaculate performances from his leading trio. Over the years, Colman has built an extensive and eclectic award-winning body of work on stage and the big and small screens. Her star was set to rise further as she steps into Queen Elizabeth II’s shoes in the forthcoming third and fourth series of TV’s The Crown, but it is her portrayal of Queen Anne that has really launched her into the stratosphere. It is a complicated role, a woman at once weak and wilful. She is prone to temperamental tantrums and moments of poignant vulnerability, and Colman dives into it with relish. Her commanding performance echoes the film’s equilibrium between humour and pathos, and she completely eschews caricature, fully embracing Anne’s humanity, never letting you take your eyes off her for a moment. If Weisz and Stone happily let Colman shine, they both offer robust support, portraying women who, despite their naked ambition, clearly did care about Anne in their own way. Weisz’s Sarah may appear ruthless, but the tender love she feels towards the monarch is demonstrably genuine and Weisz effortlessly plays the seemingly contrasting beats between the calculating and the caring. Stone, on the other hand, shifts from innocent coquette to conniving in a beat. Her objective is to reclaim her perceived rightful place in society following her ignominious fall from grace. They are roles that are sharp, funny and, for this kind of film, remarkably physical. Stone makes a spectacular entrance by falling out of a carriage face first into the mud, while Weisz’s Sarah at one point has a rather violent, vomit-spewed fall off a horse. Yet, in a film that includes duck races, a colony of rabbits let loose in the Queen’s chamber – representing her 17 failed pregnancies – and the depiction of the palace sport of throwing fruit at naked politicians (now isn’t that a wonderful idea), a muddy pratfall seems ordinary. Another of the film’s myriad strong points is the way gender roles are subtly reversed as the women totally command the film and rule proceedings within the story. The men, in their OTT wigs and excessive makeup, do little but faff about. And some very good faffing it is too, from Nicholas Hoult’s flamboyant Tory opposition leader Robert Harley; Mark Gatiss’ Duke of Marlborough, Sarah’s husband; and Abigail’s potential suitor Samuel Masham played by Joe Alwyn. They all fit in perfectly in this mad world created by Lanthimos and his team; where the sharply-written script and characters created by Deborah Davis and Tony McNamara develop despite the action’s frenetic pace. 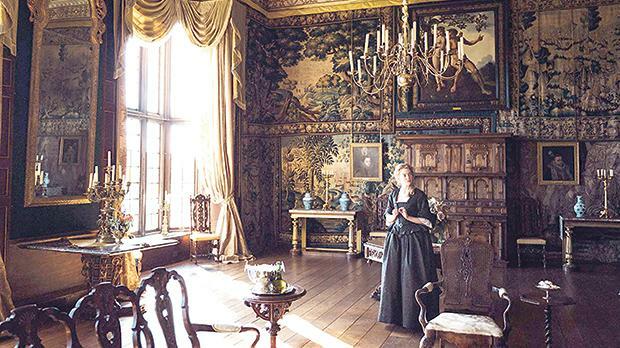 It is all set against the backdrop of Anne’s ostentatious, lavishly furnished palace, with beautifully designed costumes by Sandy Powell, whose monochrome palette makes them all the more striking. All elements that have come together to make The Favourite my favourite film of 2019 so far.